Every Wednesday morning, all elementary aged students can be seen singing, dancing, and learning about Jesus. HCA’s Elementary Chapel is a fun-filled environment that encourages elementary students to grow in their faith as well as with their relationship with God. Every month in Elementary Chapel a new character trait is selected. Throughout the month this trait is focused on not only in chapel but also in the classroom, using scripture and daily activities. 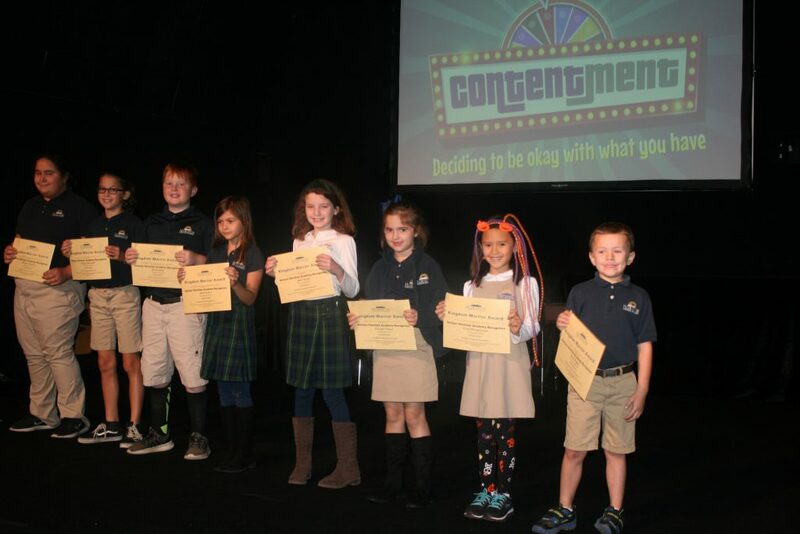 The Kingdom Warrior Award is a monthly award given to elementary aged students for living out a character trait that we are highlighting in our chapel. For the month of October, the character trait was contentment or being happy with what you have. Teachers observe their students throughout the month and recognize a student or students who have gone above and beyond in showing how they’ve learned to trust God through contentment. It’s another great way that HCA life is more than just learning but also experiencing. This monthly spiritual emphasis is one of the many ways that Horizon partners with families of students to help build a Christ-centered education as well as Christ-centered lives.